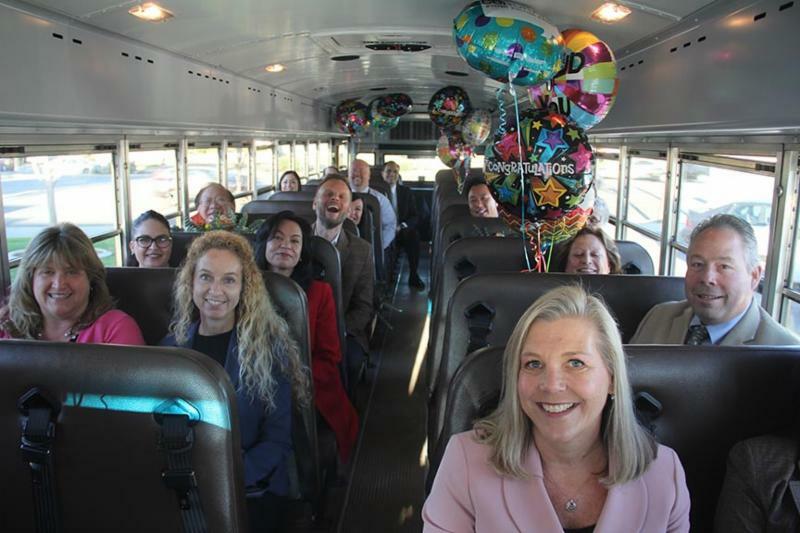 It was an exciting day as the Board of Education, Superintendent Dr. Mitchell and District leadership boarded a bus yesterday morning with flowers and balloons in hand to embark on "surprising" our District Employees of the Year for 2019-20! Congratulations to these outstanding employees who represent all of the amazing employees in the Rowland Unified School District. 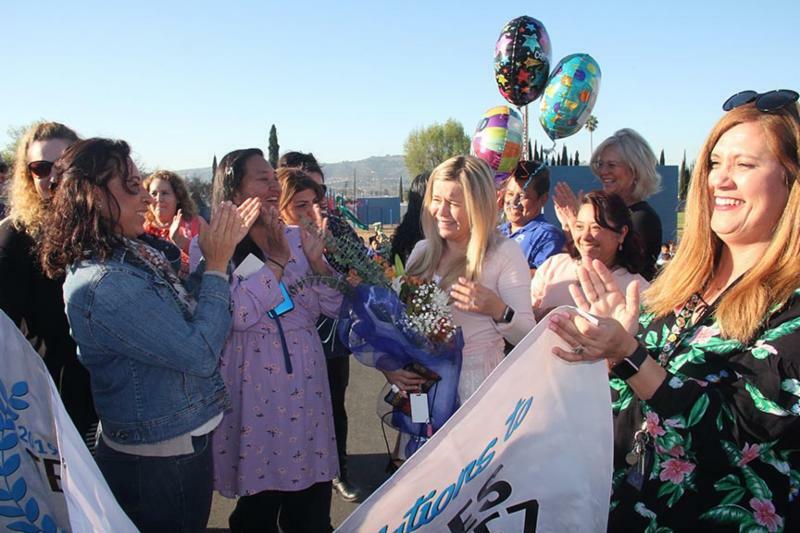 It wasn't an assembly for Yearbook photos... it was to congratulate Hurley Third Grade Teacher Dolores Gonzalez for being selected as Rowland Unified School District Teacher of the Year! 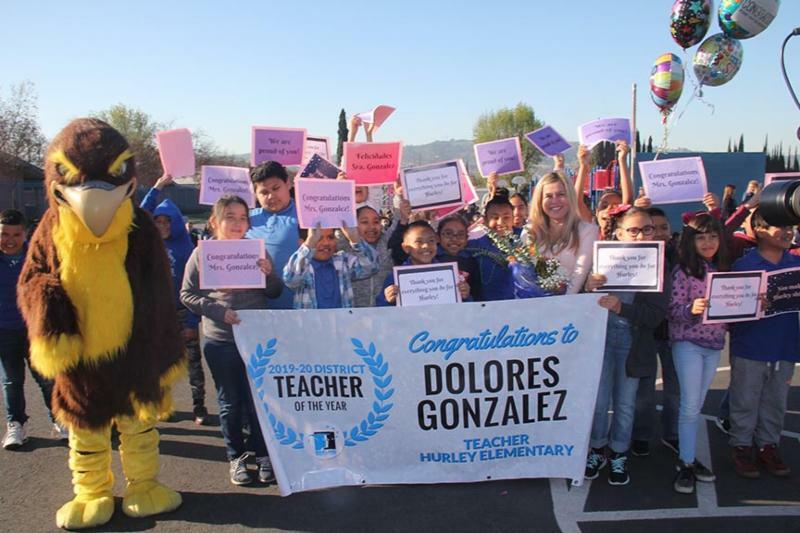 Dolores Gonzalez has been teaching at Hurley Elementary School for the past 22 years and is valued as a go-to person for her dedication and willingness to serve the school community. 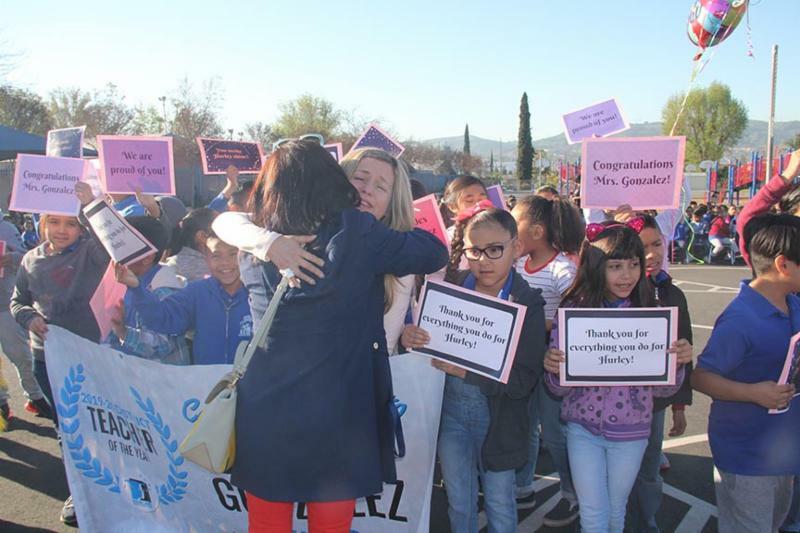 She is currently a third grade teacher and holds high expectations for her students and supports all students to reach their full potential. 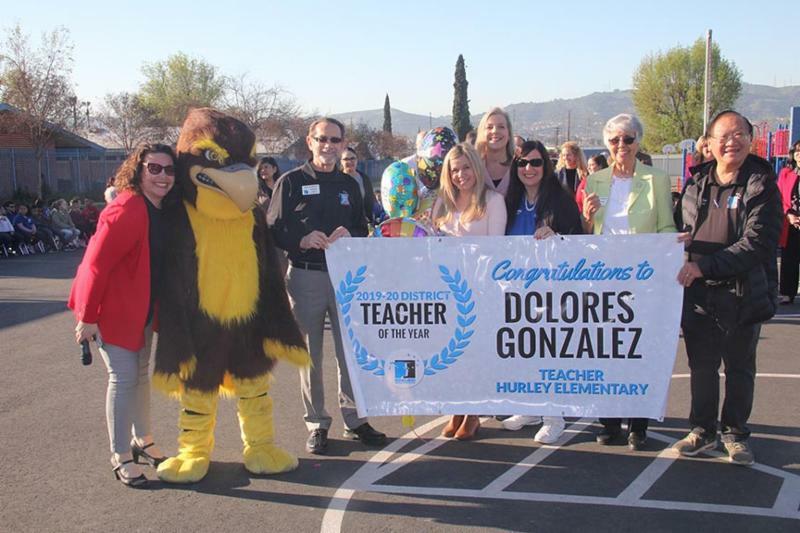 Dolores is a life-long learner and has taken her instruction to the next level with CGI and Educational Technology. She serves as a leader to the school site by serving on the Leadership Team, PLC facilitator, and the Dual Immersion representative. 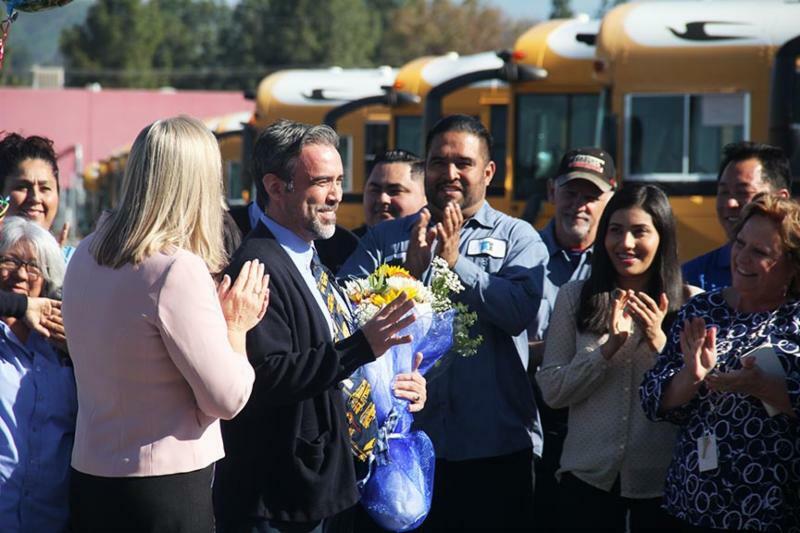 Having grown up in the Rowland community, Alfonso Iniguez began as a Substitute School Bus Driver in September, 2000 and transitioned to a School Bus Driver in February, 2001. 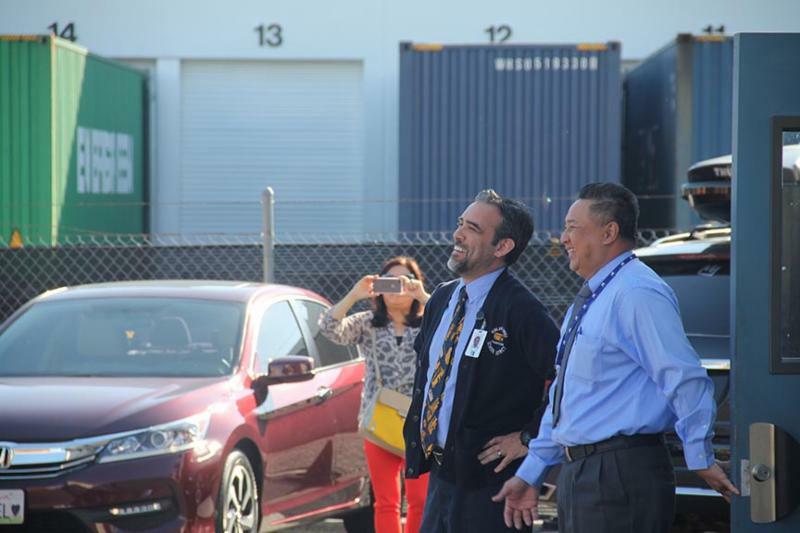 For nearly 20 years, Alfonso has safely greeted students and families each morning with a smile and warm hello as he drives children to school. 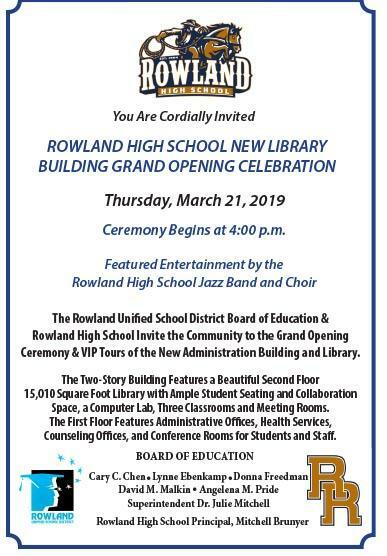 Alfonso is committed to his duties and providing excellent customer service to the parents, teachers and students in the Rowland Unified School District family. 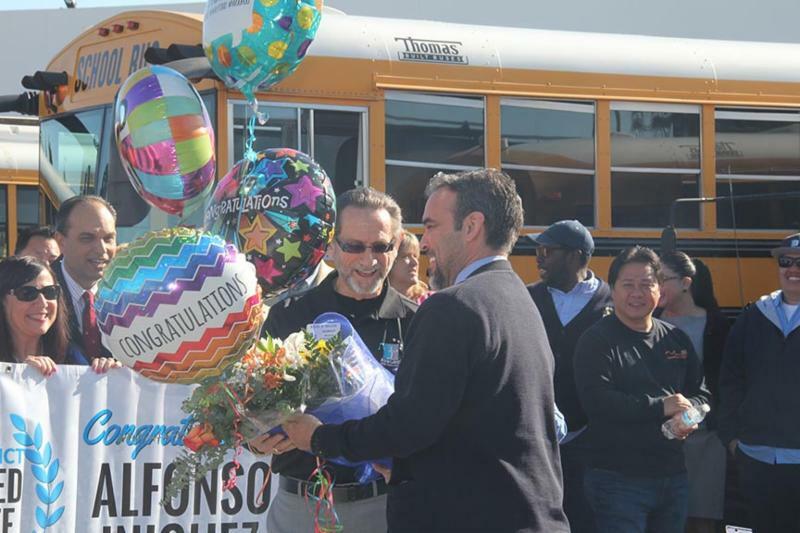 Alfonso is kind to all, is respected by his peers and loves working in RUSD. Move that bus! 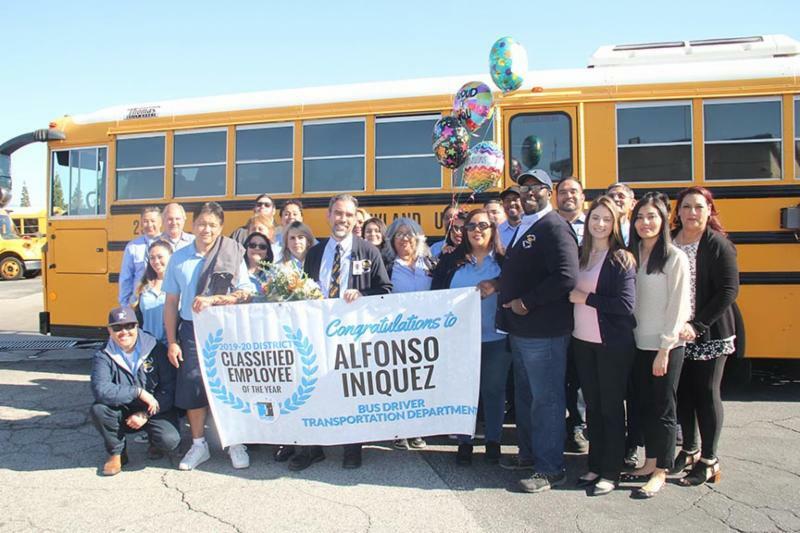 Called into a "meeting" with Transportation Director Steve Bui, Bus Driver Alfonso Iniguez was shocked as a team announced him as Classified Employee of the Year! 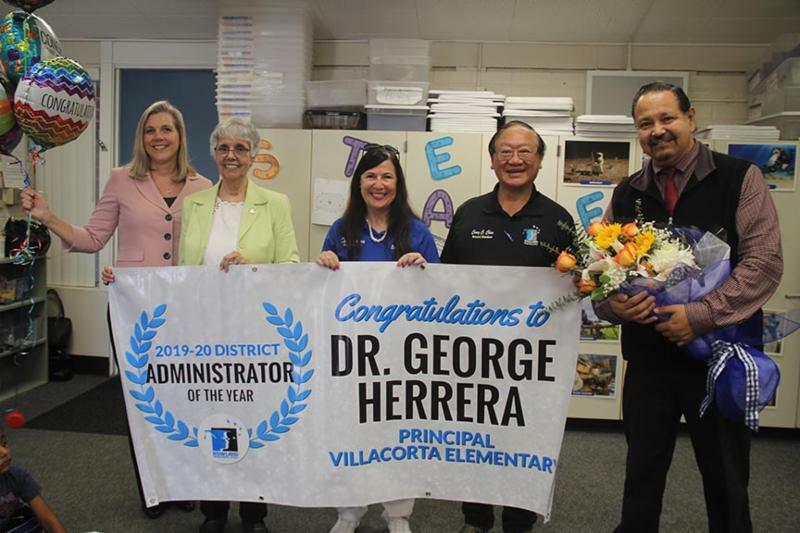 Dr. George Herrera began as a teacher at Northam Elementary in 1993 and has provided service for the past 25 years as a Cotsen Mentor, Program Specialist, Intermediate Assistant Principal and is currently in his third year as the Principal of Villacorta Elementary School. George has a focus on continual professional growth for himself and the schools in which he serves. 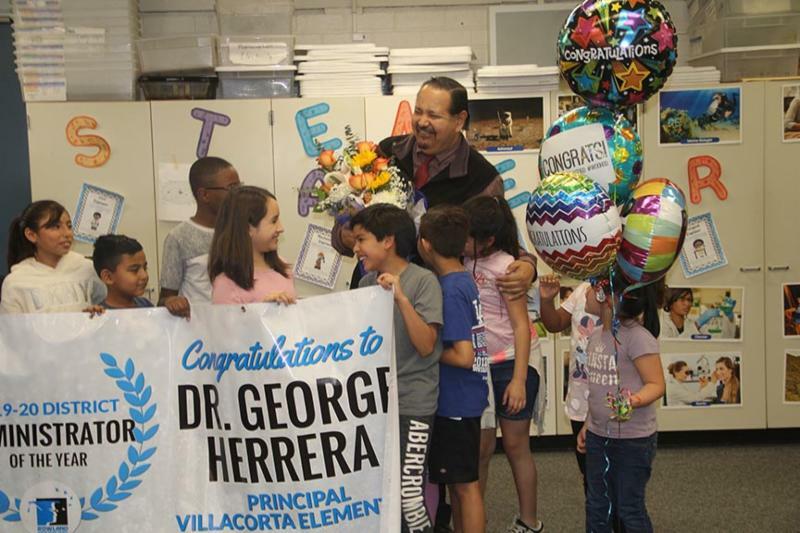 At Giano, he facilitated the initial stages of PBIS and is leading that work at Villacorta. 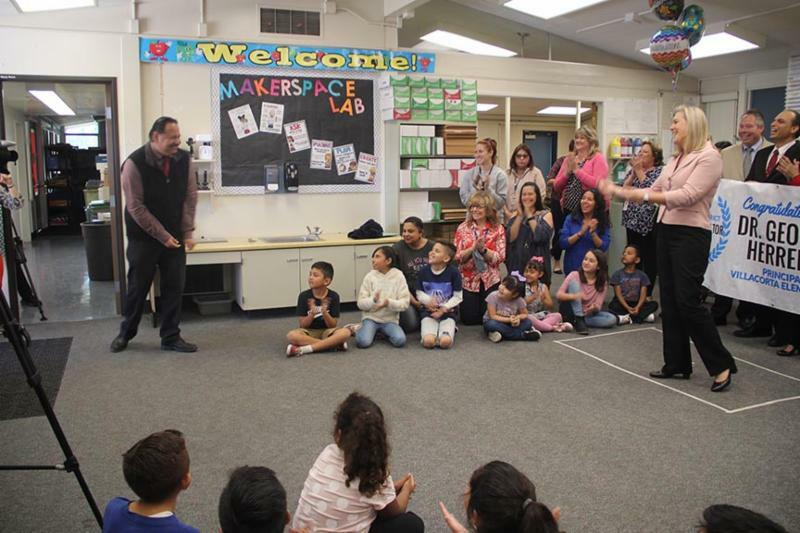 He is respected as a leader among district Principals and has been recognized by several outside agencies including the California Legislature for Outstanding Contributions to Education and by CABE for excellence as a Bilingual Educator. 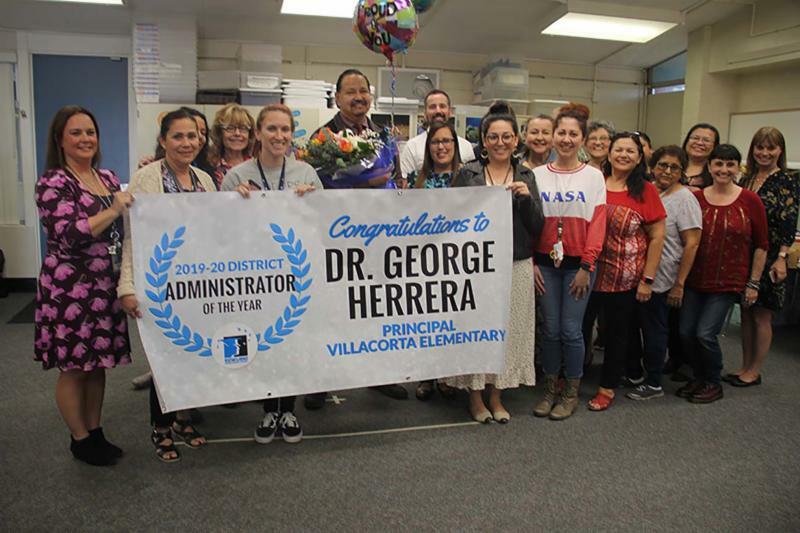 Staff pulled a fast one on Dr. Herrera when they moved the staff meeting... only to find cameras to capture the surprise announcement for District Administrator of the Year! 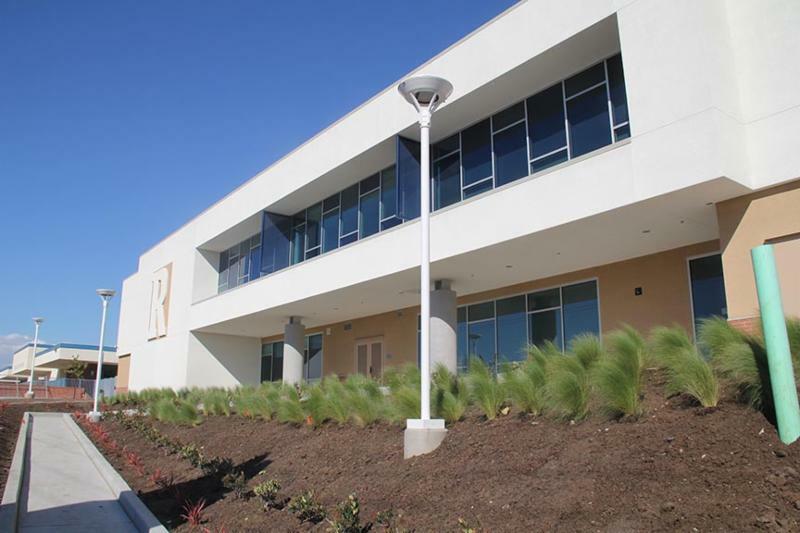 The District Employee of the Year Recognition Dinner is Wednesday, May 15 at 5 PM at the Diamond Bar Center. If you would like to applaud our fellow employees and attend the celebration, please contact the Superintendent's Office at ext. 8303.